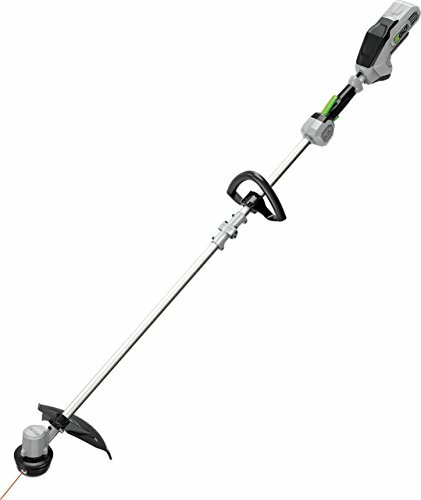 The EGO Power+ 15-Inch Cordless String Trimmer is an upgraded version of the previous 12” trimmer released in 2014. Designed with the latest trimming technology, this unit features a powerful 15-inch cutting swath with a large aluminum shaft to make trimming more simplified. The EGO Power+ 15-Inch Cordless String Trimmer comes with some minor upgrades that are not available in the previous version. First, this unit features a large 15” cutting edge as compared to the previous 12” version. Secondly, this weed eater uses more power thanks to the 56-volt, two-amp hour battery that offers a superb 20 minutes of light use or 10 minutes of heavy use. According to the majority of customers who’ve used this string trimmer, the powerful battery and large cutting edge are some of the factors that have propelled this unit to be featured among the best. Although the motor is slow to start, its amazing performance when trimming makes it perfect for homeowners living in suburban areas. A powerful brushless motor—the first feature we appreciate about this weed eater is the powerful motor. The reason why the manufacturer included such a motor is the 15” diameter string as opposed to the previous model’s 12” diameter string. The powerful motor was therefore necessary to ensure that it powered the string to cut more grass in the yard without overheating. A powerful battery—another amazing feature with this weed eater is the 56-volt, 2.0-amp battery. Located behind the trigger and the handle, this battery is powerful enough to power an entire chainsaw. The battery has a runtime of 15 minutes, making it even more useful when trimming your yard. This weed eater is designed with a powerful motor that allows you to trim stubborn weeds within a minute. The manufacturer has added some padding on the handle to absorb vibration and increase comfort. This weed eater has a fast recharging time of around 30 minutes. The 56-volt Lithium-ion battery is powerful enough to support the 15” cutting edge when trimming tough weeds. This weed eater operates for only 15 minutes before running out of power. This means that you’ll have to spend a lot of time recharging before you complete a single task. This unit is not weather-safe, meaning it can’t be washed with a hose. The EGO Power+ 15-Inch Cordless String Trimmer is among the best trimming tools developed by EGO. Available at an affordable price, this model is easy to operate and is less noisy compared to gas powered alternatives. The four-amp battery, 15” string, and the padded handle are some of the features that make this weed eater among the best on the market. Welcomed with a superb 4.6/5-star rating from 270 customers, this unit is what every homeowner needs to trim and keep the entire yard clean and free from weeds. Despite its high performance, most customers have opted to compare at least two more string trimmers with a close price range but several different features and technologies. One of the string trimmers we compared was the WORX 13″ Cordless Grass Trimmer with 56V Max Li-Ion, In-line Wheeled Edging, and 90min. Charger – WG191. Powered by a strong 56-volt, Lithium-ion battery, this string trimmer accomplishes most challenging tasks with zero gas emissions. This trimmer comes with an adjustable handle and a button that allows you to convert it from a trimmer to an edger without wasting any time. Although this unit is quite heavy (13 pounds), most customers have appreciated the automatic features and smart technology used by this string trimmer, stating that it saves you time when accomplishing your trimming tasks. Next, we compared the GreenWorks 2100202 G-MAX 40V 14-Inch Cordless String Trimmer (Attachment Capable), Battery and Charger Not Included. An eco-friendly trimmer that doesn’t emit any gas, the GreenWorks 2100202 offers you the perfect way of trimming and edging your yard to remove any debris and overgrown weeds. Powered by powerful 20-volt, 24-volt, and 40-volt Lithium-ion batteries, this string trimmer accomplishes all trimming tasks with a power similar to that of a gas trimmer. Designed with a 14” cutting string, this trimmer is compatible with most gas attachments, making it a perfect weed eater to tackle most tough grass cutting tasks. Having reviewed all three cordless string trimmers in this post, we found out that the EGO Power+ 15-Inch Cordless String Trimmer was by far the best. Designed with the latest trimming technology, this weed eater is powered by a strong 56-volt battery that allows it to perform tough cutting tasks in a short amount of time. A majority of customers appreciate the 15” cutting edge and the fact that this trimmer operates for 20 minutes without needing a recharge. Available at an affordable price, this weed eater is the perfect option for both young and old homeowners who are looking for a light and versatile string trimmer. In the runner-up position, we reviewed the WORX 13″ Cordless Grass Trimmer. Another powerful trimmer with zero gas emissions, the WORX 13″ Cordless Grass Trimmer is powered by a long-lasting, 56-volt Lithium-ion battery that allows it to perform all cutting tasks without any compromise. This trimmer is easy to operate and easy to convert from trimmer to edger. Available at an affordable price, this weed eater is light and perfect for customers looking for a mix of style and performance. Last but not least, we reviewed the GreenWorks 2100202. A high-quality trimmer designed to complete all yard work, this unit is powered by strong 20-volt, 24-volt, and 40-volt Lithium-ion batteries. Available with a 14” string edge, this trimmer is compatible with most gas trimmers, making it a versatile weed eater compared to the competition. Welcomed with very high ratings on Amazon, this trimmer is a perfect alternative if you’re looking for a cheap but responsive string trimmer.